Preheat a saucepan over medium heat. Add the butter and a little olive oil. Add a little of the garlic, oregano, and nutmeg. Once the garlic has softened (without browning too much), fill the saucepan with spinach without smothering it. Mix to combine and continue adding spinach as what’s in the pan shrinks, but try to make sure the spinach doesn’t lose its vibrant color. Remove the spinach from the saucepan and place in a bowl to cool. In the meantime, in a warmed saucepan, add a little bit of olive oil, the rest of the garlic, the basil sprigs and the tomatoes. Pour in a bit of water from the tomato can. Bring to a boil, lower the heat and let it cook at low heat. Season to taste and add the sugar. Let cook at low boil for 10 minutes or until you reach your desired consistency. Taste and adjust the seasoning. Once it’s ready, remove from the heat and add fresh basil on top. Line the bottom of the baking dish with sauce (save some sauce to use on top). When the spinach is cool to the touch, drain the water (don’t throw it out, leave it in the bowl). Chop the spinach and put it back in the bowl with the water. Add the ricotta cheese, walnuts and parmesan. Stuff this mixture into pastry sleeves to distribute it evenly in the cannelloni tubes. 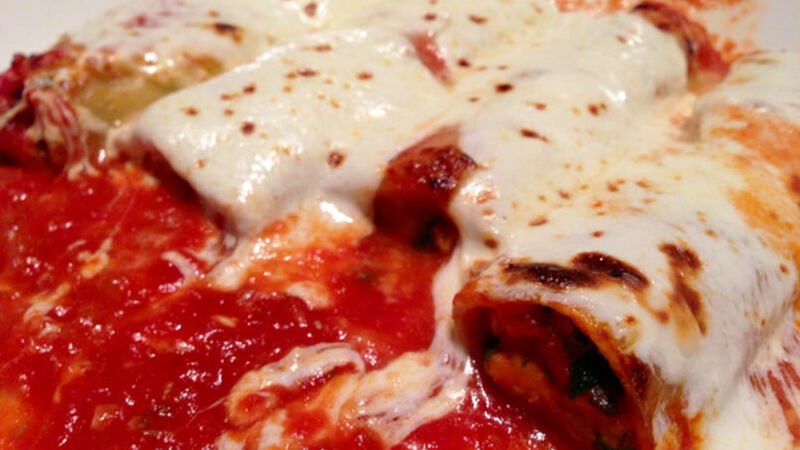 Place the cannelloni over the sauce in the baking dish. Cover with tomato sauce and béchamel sauce. Add a little bit of olive oil over the cannelloni, parmesan cheese, pieces of ricotta, and bake for 20-30 minutes or until golden and bubbling on top. For the béchamel sauce, mix the ingredients and start stirring as soon as you pour the milk to prevent lumps. Béchamel works wonderfully as a sauce, but you can also prepare a lighter version or even a cream. All you need to do is change the quantities of your ingredients to give it the texture you want. Follow these instructions: Light sauce: 3 tablespoons butter + 3 tablespoons flour. Béchamel sauce: 4 tablespoons butter + 4 tablespoons flour. Béchamel cream (great for empanada or pie fillings): 6 tablespoons butter + 6 tablespoons flour. Use a baking dish that allows you to place all the cannelloni on a single layer to ensure the right amount of sauce and the proper texture of the pasta. For more flavor, lightly toast the walnuts or almonds before chopping them. Make your own pastry sleeve by simply cutting off the corner of a hermetically sealed plastic bag. You can make this dish beforehand, freeze it and use it when needed. You can also explore different fillings and the same combination of sauces, or simply with tomato or béchamel sauce. Pasta recipes? Plenty! Good pasta recipes? Not always. The secret is to take advantage of the simplicity of pasta; use fresh, good-quality ingredients; and prepare it with simple techniques. This is one of my favorite recipes, suitable for our on-the-go routines. You can cook it the same day, but I strongly advise you to prepare the sauces with a bit more time. You can freeze this pasta and use it another time.